The Minnesota chapter of the Public Relations Society of America (PRSA) today announced that it has installed its executive leadership team and Board of Directors for 2016. 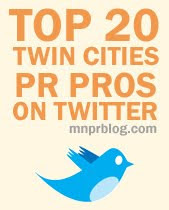 Minnesota PRSA is the ninth-largest chapter of PRSA, the world’s leading organization for public relations professionals. Led by new President Jason Sprenger, APR, president of Game Changer Communications, Minnesota PRSA is comprised of more than 400 corporate, agency, independent, non-profit and government public relations professionals from Minnesota, the Dakotas and Western Wisconsin. Through its programs and services, Minnesota PRSA delivers on its mission of engaging members at every stage of their careers with the knowledge, resources and connections to achieve professional excellence, driving ethical and strategic outcomes, and advocating for the profession. “It is an exciting time to be involved with Minnesota PRSA, which has been an integral part of the communication scene in the Upper Midwest for about 70 years,” said Sprenger. “Communicators in today’s global society must be empowered on as many platforms and channels as possible. Accordingly, we’re doing more than ever before to help our hundreds of members engage, connect with and learn from each other and the broader business community. We’re committed to ensuring that Minnesota PRSA and its members continue to grow, and that the chapter remains an essential servant to and resource for our community."